Clifton Fernandes scored in added time to save the day for the capital club. 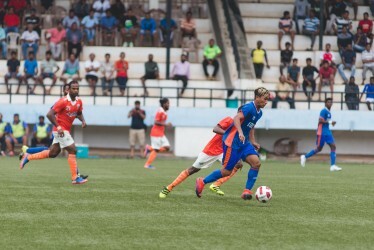 New entrants Panjim Footballers held Salgaocar FC to an entertaining 3-3 draw in the opening match of the Goa Professional League played at Duler Stadium earlier today. Salgaocar had a very good pre-season as they had won their all pre-season friendlies but the only setback for the Greens was that they were defeated by Kerala side Gokulam FC in the semifinals of AWES Cup earlier in September. While Panjim had lost four out of five pre-season matches against Sporting Clube de Goa and Calangute Association. Their only win was against Corps of Signals. Salgaocar coach Norberto Gonsalves made few changes to his side which lost in the semifinals as Umesh Harijan was back in the starting XI. While he also brought in Devendra Murgaonkar and U20 Ribhav Sardessai. Panjim coach Savio Vaz also made a couple of changes to his side as he introduced newly signed Mahesh Kumar and Ruflon Fernandes in the playing XI. The capital city side started the match impressively and surprised the defending champions when they drew the first blood through Ruflon. The striker blasted in from the close after getting hold of the loose ball in the box making it 1-0 for Panjim side. A few minutes before this, Panjim had a golden opportunity to go into the lead but Salgaocar keeper Abijit Das made a diving effort to pushed away Chandan Gawas’ placement from 10-yards. Even after conceding in the early minutes, Salgaocar regrouped and found the equaliser within next six minutes. Harmanjot Singh brilliantly headed in from close off Gilbert Oliveira’s pin-point perfect corner. Energized by the equaliser, Salgaocar scored two more goals before the half-time and put them in commanding position at the end of first half. First, Gilbert made no mistake from the penalty spot after Panjim’s Kunal Kundaikar handled the ball inside the box in the process of clearing Devendra’s short pass in the box.While Devendra made it 3-1 for Salgaocar in the 25th minutes when he his flick shot finished in the back of the nylons off Gilbert’s perfect corner. Panjim came out stronger in the second half and created many chances but Salgaocar last line was too strong to break as their every move was killed outside the danger area. However, Salgaocar also had a chance to inflate their lead within a just seven minutes of resumption when Harmanjot was in one-on-one with Panjim custodian Sherwin Da Cunha but the midfielder’s shot hit the keeper and went out for a corner. At the other end, Panjim reduced the margin with just ten minutes left on the match clock. Harshad Naik brilliantly scored from the penalty after Salgaocar skipper Rosario Mendes handled the ball in the danger box. The last few minutes were intense for Salgaocar as one-way traffic was troubling the defenders and finally, in the added time, Clifton Fernandes scored the screamer from outside the box to Panjim on a level.